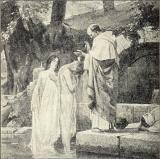 ST. PATRICK BAPTIZING IRISH PRINCESSES. Saint Patrick, the Patron saint of Ireland is credited with converting most of Ireland to Christianity and establishing the Celtic Church there. Patrick was not actually the first Christian missionary who worked in Ireland and there were small Christian communities in Ireland before he arrived. During Patrick's long residence there, however, tens of thousands of Irishmen were baptized, including princes and chieftains; dozens of churches and monasteries were founded, and hundreds of Irish, both men and women, entered the religious life. When Patrick died in the late fifth century, Christianity was firmly established in Ireland, and it was from the monasteries and abbeys of Ireland, that Irish missionaries ventured out to convert Scots, Welshmen, other British Celts. Patrick was born into a Christian family in Wales, while Britain was still under Roman occupation. Very shortly after he was born however, the Roman legions withdrew and the Britons were left prey to marauders from the sea as well as Pictish savages from the north. Patrick had the misfortune to be captured as a young man and sold into slavery in Ireland, where he toiled for six years. Upon his return to civilization he decided to enter the religious life, and eventually ended up at the monastery of Auxerre in Gaul. There he was ordained and lived for many years, but eventually requested an opportunity to work as a missionary in Ireland, where he had spent so many years in captivity. He did not travel alone, but brought several other priests with him, and together they traveled peacefully, and unarmed through the dangerous realms of the warlike Celts and Druids. Patrick's adventures in Ireland were varied and numerous, but mostly consisted of him traveling from tribe to tribe, befriending the people, and preaching the word of the Gospel. He spoke always of the love and majesty of his God, and dealt with the Irish always with courage, patience, kindness, and good cheer. He found many churches, baptized thousands of people, and ordained priests and nuns from among his flock. One of the most famous stories of Patrick involves a Celtic chief named Loigaire who at first sought to kill Patrick and his followers, but upon seeing their courage in the face of death, not to mention a few miracles, he became one of Patrick's most faithful patrons. Another legend tells how Patrick explained the mystery of the trinity using a shamrock, and still another that he drove all the snakes from Ireland. Patrick served many years in Ireland—at least forty years, before being summoned again to his maker. There are chronological inconsistencies in the histories of Saint Patrick, that make dating the important milestones of his life difficult. His timeline is therefore arranged according to his approximate age, and estimates are given for his dates of birth and death. There are dozens of stories of his marvelous adventures in Ireland once he arrived in Ireland, but their chronological sequence is unclear. Age 16 Captured from his home in Wales and carried off, as a slave to Ireland. Age 22 Escaped from captivity and found passage home. Age 24 Entered monastery at Auxerre for fourteen years. Age 38 Ordained as a bishop. Embarked on mission to Ireland. Hengist and Horsa Two Jute princes were invited to Britain in order to help fight the Picts. Saint Brigid Patron saint of Ireland (with Patrick). Founded a monastery at Kildare in Ireland. King Arthur Legendary king of the Britons. Palladius Missionary who was sent to Ireland before Patrick. Saint Germanus Renowned Bishop from Gaul visited Britain in order to help combat Pelagianism heresy. Loigaire Celtic chieftain who first opposed, then protected Patrick. Iserninus Priest from Auxerre who accompanied Patrick to Ireland. Auxilius Priest from Auxerre who accompanied Patrick to Ireland.